9 February 2013 was World IA Day – a global event in 15 cities where folks got together to discuss various aspects of “information architecture” (IA). I attended the Canberra event, run by one of my best friends, Donna Spencer. It was a lovely intimate group, covering interesting topics such as a great presentation about project management and IA personas (The Professor, The Tool, The Dummy Spit, The Baby and The Professional), testing your IAs and more. One of my favourite sections was covering the various tools that we all used. Here’s my raw notes from the ‘tools discussion’ so I can remember to come back and explore some of them. 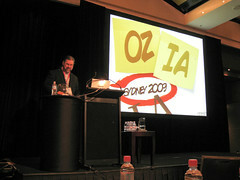 Another Oz-IA conference has passed and it was great. There were a lot of familiar faces but also a large number of new faces. The twitter back channel were buzzing with activity for most of the conference, no doubt fuelled by the on-site barista and fruit cocktail maker. Here’s a rundown of some of the presentations. Not every session is covered. Continue readingOz-IA 2007 is here!